Photo by Leon Neal/Getty ImagesPrime Minister Theresa May. LONDON – Britain will not pay off its Brexit divorce settlement until the year 2064 – 46 years from now – according to the latest economic forecasts from the Office for Budget Responsibility. The UK government has agreed to pay £37.1 billion to the European Union as part of its departure from the bloc, in order to pay off financial commitments it signed up to prior to the British public voting for Brexit. 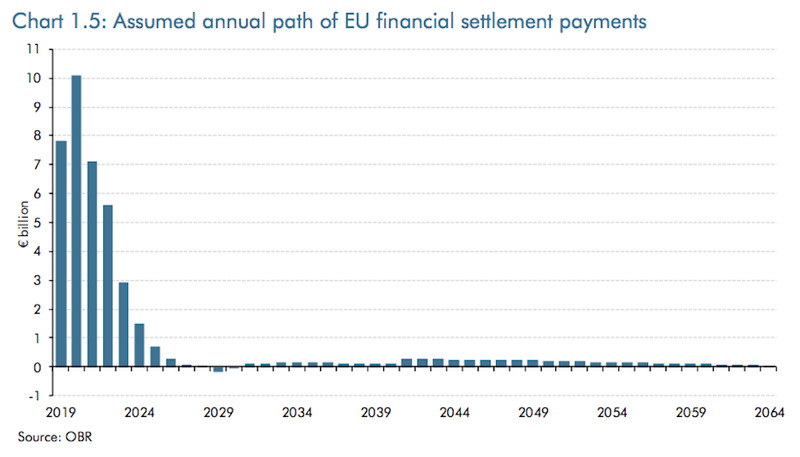 However, the OBR has revealed today this sum will be paid off via staggered contributions lasting to the year 2064. The UK will pay £16.4 billion worth of contributions into the EU budget between the years of 2019-2020; £18.2 billion between 2021 and 2028 for outstanding commitments; and £2.5 billion worth of net liabilities spread out between 2019 and 2064, according to OBR estimates, which you can read here. 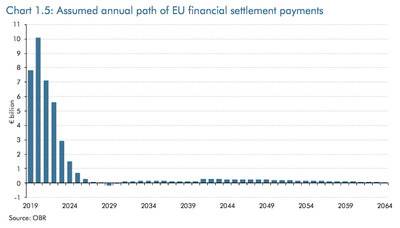 Here is the key graph. 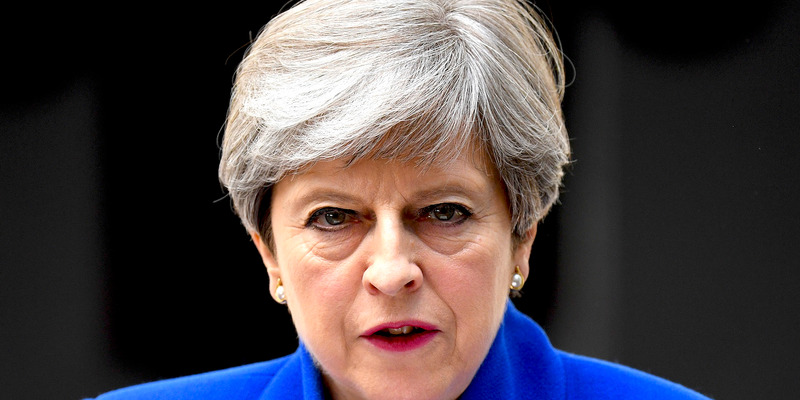 Prime Minister Theresa May has repeatedly insisted that Brexit will mean Britain taking back control of its laws, borders and money. “The agreement we reach with the EU must respect the referendum. It was a vote to take control of our borders, laws and money,” she said in her most recent keynote speech on Brexit negotiations. However, today’s figures suggest that Britain will continue making financial contributions to Brussels decades after ceasing to be a member state. 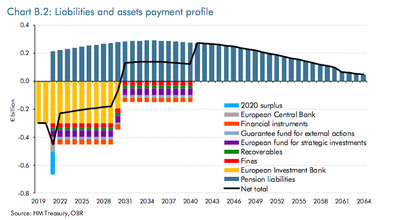 Britain will spend nearly quarter of a century – from 2040 to 2064 – paying off what it owes in pension liabilities, as illustrated another graph, shown below. The ORB figures formed the basis of Chancellor Philip Hammond’s Spring statement, which was unveiled shortly after lunchtime on Tuesday. They do not account for future payments Britain may make in exchange for access to the single market or participation in European agencies. Prime Minister May said in her Mansion House speech on Brexit that she is prepared to pay the EU in return for membership of agencies covering areas like medicine, chemicals and aviation. “We accept this would mean abiding by the rules’ and making an appropriate financial contribution,” she said last month.